Trazodone is a prescription medication approved for the treatment of major depressive disorder in adults. It is also used off-label to manage several other conditions. While millions of people use the medication, few understand how it works. 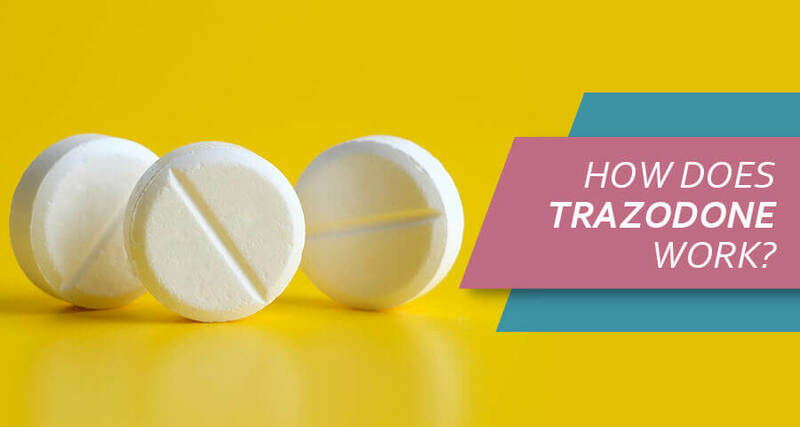 Here are things users should know about the Trazodone mechanism of action and what conditions it can treat. How is Desyrel Used For Depression? What Is Oleptro Use For Sleep? Can Trazodone Be Used For Anxiety? How Do They Use Desyrel For Bulimia? What Is The Oleptro Mechanism Of Action For Dementia? How Does Trazodone Work For Alcoholism? What Is Desyrel Use For Opiate Withdrawal? How Does Oleptro Work For Sexual Dysfunction? Can Trazodone Be Used As A Painkiller? All medications, including Trazodone, have a mechanism of action: the way the medication acts on the body to produce the desired effects. However, Desyrel’s mechanism of action is not perfectly understood. The medical community understands quite a bit about how Trazodone does work, but as is true for all serotonin uptake inhibitors, there is still some mystery there. When studied in animals, what Trazodone does is selectively inhibit serotonin uptake by brain synaptosomes and then amplifies the changes in behavior caused by 5-hydroxytryptophan. It does this by binding to the 5-HT2 receptor. How it impacts serotonin depends on the Trazodone dosage taken; at a low dose, it functions as a serotonin antagonist, while at a high dose it becomes a serotonin agonist. Many patients wonder how long does Trazodone take to work. The answer to this depends on what the medication is being used to treat. For example, when treating depression, Trazodone works in approximately one to two weeks before the benefits are noticeable. But, when treating insomnia, Trazodone takes to work anywhere from 30 minutes to a couple of hours. While the mechanism of action results in effective treatment for many, it is not successful in every case. Patients should always work closely with a doctor when using the drug. There are many off-label Trazodone uses, but only one on-label application: the treatment of major depressive disorder in adults. Despite the FDA not approving it for the treatment of other conditions or use in pediatric patients, Trazodone is used for treating conditions ranging from anxiety to dementia and is often prescribed to those under the age of 18. What Trazodone is prescribed for most often is the treatment of mental health issues, including depression and anxiety. However, Desyrel uses are far-ranging, and it is possible new ones will be discovered as time goes on. Here is what patients should know about what Trazodone is used to treat. Trazodone is FDA approved for the treatment of major depressive disorder in adults. It has long been proven effective at treating the condition. When using Trazodone for depression treatment, doctors prescribe the medication to restore balance to the chemicals in the brain. It does this by increasing the amount of serotonin present, which is known as one of the body’s natural “feel-good” chemicals. As the body adjusts to having more of it present, the symptoms of depression ease off. However, there are some dangers when using Desyrel to treat mental illness. This is because the medication can increase the risk of having suicidal thoughts and actions. While the majority of patients do not experience this, the risk is ever-present. Patients can take the drug for extended periods when treating depression and should see their doctor at least once every six weeks for the duration of treatment. The use of Trazodone for sleep was discovered by accident. One of the side effects of Trazodone is drowsiness. When used for patients with depression, it was found that the medication made them sleepy, and doses taken at night often resulted in sound sleep. As such, doctors began using Trazodone for insomnia treatment. Now, it is more often prescribed for insomnia than depression. When using Trazodone as a sleep aid, patients should take it as they are getting into bed. How long does it take for Trazodone to make you sleepy? In most cases, it should facilitate falling asleep within 30 minutes to two hours. Using Trazodone for sleeping is not recommended for use longer than a few weeks. Despite how often it is used to treat sleep issues, there is not enough clinical data to justify FDA approval for this use. The most significant risks of using the medication for insomnia treatment are becoming dependent upon it for sleep and the medication losing its effectiveness. In some cases, doctors use Trazodone for anxiety, especially when it presents at the same time as depression or insomnia. How long does Trazodone take to work for anxiety? The medication tends to affect anxiety faster than it does depression. When used for anxiety, the mechanism of action is the same as with depression. Despite not having FDA approval for anxiety treatment, other countries have researched its efficacy and approved its use in treating generalized anxiety disorder. The biggest risk of using Trazodone for anxiety during the day or at night is that sometimes it worsens what it is meant to treat. One of the concerning Trazodone effects is that it can increase anxiety or cause anxiety in patients who previously had no related disorder. Because of this, patients should be closely monitored for as long as they are taking the medication. According to the limited studies, Desyrel is useful in the treatment of bulimia, in both short-term and long-term use. However, this use is not as well-studied as others. Published research focus on small groups of test subjects, sometimes fewer than 10. As such, it is hard to say if it is effective at treating bulimia. The risks associated with treating bulimia with the drug come down to the way the medication impacts mental health and the Trazodone withdrawal side effects the user might experience when stopping the drug. Both of these aspects could play into the patient relapsing. One of the newest applications of Desyrel is in the treatment of dementia. Studies have found that the drug can improve the behaviors associated with dementia. Some have speculated that it can prevent dementia from developing or roll back the effects of the disease once in place. However, studies have proven it does not stop dementia onset nor does it treat more than the behavioral symptoms of dementia. The biggest risk in using the drug for managing dementia-related behaviors is that it has the potential to make them worse. In some cases, Desyrel is prescribed to patients recovering from alcoholism. Usually, it is taken to manage insomnia related to alcohol withdrawals, which can last for years after the patient stops drinking. Because insomnia is linked to alcoholism relapse, Trazodone can be an effective component in keeping an alcoholic clean. However, there is a risk in doing so, as it usually is only effective for insomnia treatment in the short term, and the user could become physically dependent on the drug. Much like with alcoholism, those addicted to opiates can expect to experience insomnia when withdrawing from the substances they have been using. For many addicts, nighttime is when they are at the greatest risk of relapsing, and a lack of sleep can have a negative impact on their self-control. As such, treating insomnia with Desyrel can lessen the chances of relapse. The risks of doing so are the possibility of the user developing an addiction to the drug and insomnia returning once the medicine is no longer effective. Studies on the effectiveness of Desyrel in treating sexual dysfunction are limited. Because some forms of sexual dysfunction are related to depression, it is understood that the drug can alleviate it in certain cases. However, it is only effective when sexual dysfunction is SSRI-induced. Treating other forms of sexual dysfunction with the drug will not only be ineffective but might be dangerous due to side effects or interactions, such as mixing Trazodone and Cymbalta. Finally, another common off-label use for Trazodone is the treatment of pain. When using Trazodone for pain, it is generally for severe, chronic aching. For example, it can be used in the treatment of fibromyalgia and arthritis. However, there is a concern of overdose occurring when using it to manage pain. How much Trazodone to overdose is not the concern so much as overdose from interactions between medications. Most people suffering from chronic pain are on many medications, making adding one more a risky proposition. Whether someone is concerned they are becoming addicted to Trazodone or is worried about not passing Trazodone drug testing; there are ways of ending use of the drug. However, going cold turkey is dangerous. Instead, users should carefully wean off the drug in a medically supervised setting. Drug rehabilitation centers offer the help needed.